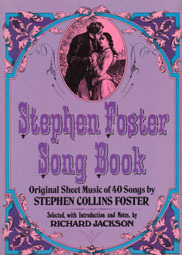 Sheet Music with lyrics for 40 songs . . .Here are all the favorite Stephen Foster songs, all reprints of first or early editions of each song. Included are "Beautiful Dreamer", "Oh! Susannah", "Camptown Races", "Jeanie with the Light Brown Hair", and many more.